The loss of their home is a very real fear for many people — whether it is to creditors or because they need long-term nursing home care. And for good reason — unless you have a concrete plan in place to protect your biggest asset, it may be at risk. You worked long and hard to buy your family’s home, so it only makes sense to want to ensure your family keeps it after you can no longer make financial decisions or after you pass away. The Chesapeake Wills & Trusts team can help you create your own rule book, including a comprehensive plan that offers protection for your family home. Creditors may come after your home if you file for bankruptcy or if they win a lawsuit against you. If you believe this may be a possibility, we can help you put an asset protection plan in place that protects your family home. We can explain to you how an irrevocable asset protection trust works, and what this means for making future decisions about your property. By creating an irrevocable trust and titling your house into the trust, you receive immediate protection from future creditors. Because the house legally belongs to the trust and not to you, they have no access to your house and cannot take it from you. It is important to note that we will likely be unable to place your home in an irrevocable trust if there is civil action currently pending against you. We must take these actions early to prevent any legal penalties. Without proper advanced planning, it may be difficult to protect your family’s home from nursing home and long-term care costs. This is the situation that scares many people the most. They imagine an all-too-real scenario where they suffer a disabling injury or illness and must move into a nursing home, losing their family home to pay for the care they need. The key to ensuring your family gets to keep their home while you also get the care you need lies in planning early enough. Most families eventually need to rely on Medicaid to pay for nursing home care, but many must spend down their assets before they qualify. If you plan for it, you can move your house and other assets into a trust before the Medicaid look-back period, ensuring your heirs keep them and you qualify for Medicaid sooner. If you move assets during the look-back period, it may significantly delay your ability to get these much-needed benefits. Creating a comprehensive estate plan takes a lot of weight off your family’s shoulders later on, allowing them to avoid the state’s guardianship process, the headache of probate, and other government processes. These processes often become necessary as a loved one ages and after they pass away. You also gain peace of mind knowing exactly what will happen to your home and can ensure your family has a place to live after you are gone. We can help you put a plan in place that meets your family’s unique needs, protecting not only your home but a wide range of assets. We may be able to keep your hard-earned assets out of the hands of creditors and protect them from being used to cover the costs of nursing home care. 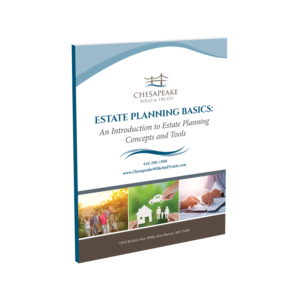 The Maryland estate planning lawyers from Chesapeake Wills & Trusts can help you understand your options to protect your home and create a plan that gives you and your family peace of mind about the future. From creating a single trust to protect your house to writing your entire rule book, we can handle any estate planning task no matter the size or complexity. Call our Maryland office today at 410-590-1900 to get started.